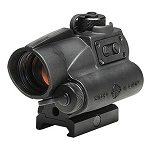 Sightmark Ultra Shot Plus SM26008 was enhanced per the requests of customers. 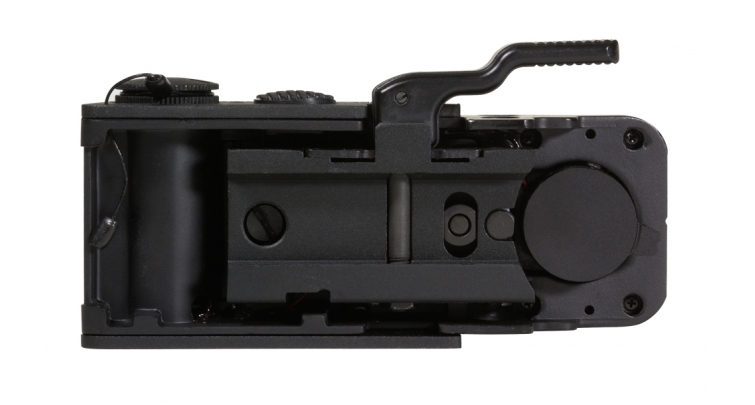 This Red Dot Sight is powered by a CR2 battery and provides 1,000 hours of continuous use. 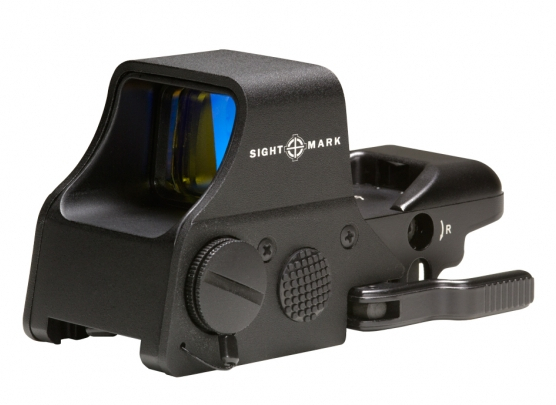 Sightmark's Red Dot Sight is ideal for close-range and fast-moving targets. 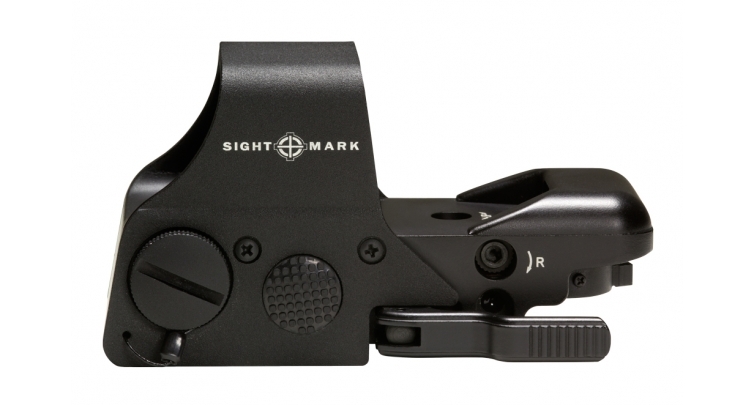 Ideal for on-the-go shooters, Sightmark's Ultra Shot is protected by a Limited Lifetime Warranty, has a quick-detach mount and durable' aluminum shield hood for added defense that is perfect for outdoor use. Had originally bought a Sightmark Ultra Shot Sight QD Digital Switch which uses 3 AG5 batteries sight worked for around 300 shots then decided it would shut off every single shot. Replaced and checked for fresh batteries and proper spring tension on batteries both work good, But still shut off after every single shot. The internal digital switch seemed to be the problem loosing momentary contact with the on/off making the sight shut off and had to be turned back on every time by hitting the switch again.I contacted sightmark about the problem and asked if i could receive a different sight with better battery life.Sightmark authorized a return and two weeks later i received this model sight the sightmark sm26008(at least i thought it would be the same) sightmark has apparently made modifications to this model as the model number is the exact same with the same name but now has two switches one for brightness and one for the green/red/on/off reticle pressing the on/off button fast will change from green to red and if held for 2 seconds will shut the sight down. The other change this sight has made is a larger higher capacity battery then the c2, Bought some c2 batteries for this sight only to find out they are to small! the sight now comes with a cr123a battery and amazingly in the manual still tells you to use a c2 battery! yet on the next page says the sight uses a cr123a and you will find out a c2 is to small to turn the sight on with. adjusted the QD clamp to tighten securely and went to test the sight, was able to zero in to a 2 inch group @ 50 yards, The sight seemed to hold zero up and down hitting around the same place each time but the left and right adjustment seemed to shift slightly to the right about two inches off target.Cant say for sure if this sight is holding zero till it is tested again and checked compared to a bore scope to see if it has shifted.The sight did not however shut off at all during the shoot or loosen up from the rail. Lens will fog in snowy/ Freezing temps below 32 F see attached FLIR photos was tested at Negative -5 F for 2 hours fogged up in about 10 minutes on both side of the lens front and back. Could not see until wiping the lens which would fog right back up Battery held up good at Negative -5 F for 2 hours voltage dropped from 3.08 volts to 3.05 still fully functioning although Primary Duracell lithium CR123a batteries have already been known and tested by NASA to be stable up to NEGATIVE - 32F so this is no surprise . 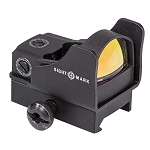 Sight also co-witnesses perfectly with Back up "iron" sights and hold position if removed and re-clamped in the same spot,as long as your not going for long distance accuracy that is 50 Yards or more.. 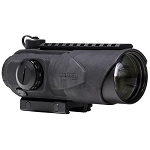 The way this optic works is by shining the reticle with an led onto the glass which is semi-mirrored. This is how most of the "budget" optics work. I'd have to say this is just about the best optic that works like this. I like that it resembles an Eotech which costs more that 5 times as much. The reticles are very sharp and I like having a selection of different reticles and colors. The sight is plenty bright. Indoors, I use the dimmest setting and outdoors I use the second dimmest setting. At first, I thought there was a problem with the sight because I was getting a lot of parallax and the reticle was blury. I realized that the sight is only parallax free after 25 yards. Inside 25 yards, there is some parallax and the reticle is blury because your eye focuses on something else. Generally at the range, I shoot 15-25 yards away and I have no problems even though it's only parallax free after 25 yards. At 15 yards, the parallax is very small and the reticle is perfectly clear. The sight is very durable and mounts well once you tighten the nut. And I really urge you to TIGHTEN THE NUT. It may feel like the sight is locked on securely but it isn't. You have to tighten the nut so that you can just barely lock the lever down or else it will fly off your gun. Mine flew off after about 50 rounds and landed on concrete. There wasn't even a scratch! But still, make sure it's on there super tight. The only drawback of this sight is the glass. Since it works by being semi-mirrored, that means the glass is tinted and not perfectly clear. This is a limitation of the design and has nothing to do with quality. I like to be able to see the target completely through the optic and if the glass isn't perfectly clear, it makes it harder to see the target in low light situations. Having a flashlight really helps in this situation. 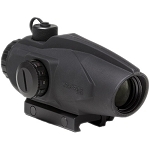 Overall, this sight is very durable and works well. For the price it can't be beat.